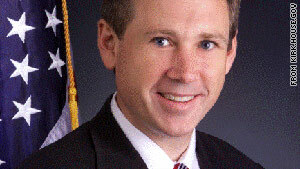 Rep. Mark Kirk has represented Illinois in Congress since 2001. The Illinois congressman, now the front-runner in the Republican primary election for U.S. Senate, is facing an attack ad that questions his sexual orientation. The Chicago Sun-Times reports that opponent Andy Martin, already controversial for previous remarks about Barack Obama, has run for offices in Illinois, Florida and Connecticut but has never won. He taped a commercial questioning whether Kirk is gay -- and radio stations have told the Sun-Times that federal communications rules don't permit them to edit the ads. Spokesman Erik Elk said that Kirk, a U.S. Naval Intelligence officer, was unavailable for comment because he is on active duty over the holidays. Elk issued this statement: "The ad is not true and is degrading to the political process. The people of Illinois deserve better." Kirk, whose candidacy was endorsed by his ex-wife, faces five opponents in the Republican primary on February 2. A woman and three men arrived at Nobel laureate Shirin Ebadi's Tehran home Monday, and after searching the house seized her sister, Nushin Ebadi, and her computer. Shirin Ebadi, an Iranian lawyer and human-rights activist honored with the Nobel Peace Prize in 2003, said the Iranian intelligence officials "detained her so I stop my work," even though Nushin is "not involved in human-rights work, and she's never participated in any of the protests," she told CNN. Nushin and her husband are professors of dentistry at Azad University in Tehran and own a private dental practice. The detainment occurred in the middle of a deadly crackdown on anti-government protests that has left several dead. The Texas Tech football coach has been suspended as the university investigates charges by wide receiver Adam James and his family about how the player was treated after suffering a concussion. USA Today posted a family statement that said, "Mr. and Mrs. James took the step with great regret and after consideration and prayer to convey to the Texas Tech Administration that their son had been subjected to actions and treatment not consistent with common sense rules for safety and health." The statement also said, "The James family believes this is a matter important to protect all the fine young men involved in Tech football and the University's reputation for developing and educating young men and women." Leach was the Big 12 coach of the year last season and has a five-year, $12.7 million contract. The Oakland, Tennessee, police officer was shot at point-blank range by a driver he had pulled over on Christmas Eve. "It felt like someone hit me in the chest with a baseball bat," Smith told WMC-TV. "I couldn't breathe, I couldn't catch my breath. At that point I was worried about finding a wound and stopping the bleeding," Smith said. But the bullet hit his steel badge. Smith says doctors told him that without his badge, the shot in his chest could have killed him. The company that makes the badges is sending him a replacement. The mom and her baby both were pronounced dead during labor. But KKTV reports that doctors were able to bring them both back to life. On Christmas Eve, Tracey and her husband Mike went to Memorial Hospital in Colorado Springs, Colorado. "I guess I went into cardiac arrest and I really don't remember anything after that," said Tracey. "She was dead, she had no heartbeat, no breathing," said Stephanie Martin, the hospital's director of maternal fetal medicine. Martin then performed an emergency Caesarean section in the delivery room. But when baby Coltyn was delivered, he wasn't breathing. "Immediately after delivering him, her pulse came back," Martin told KKTV. She said when pregnant women have complications, they sometimes recover once the baby is delivered. Coltyn's motionless body was handed to his father, Mike, as doctors kept working to revive the baby. "They actually got him started right in my hands, that is an amazing feeling," said Mike.